See What Different Cloth Colors Look Like on the Table Below by Mousing Over the Colored Squares at Right! Our casino quality billiard cloth is available by the yard. 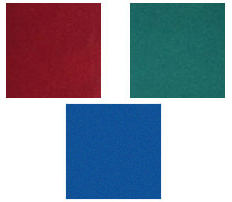 Green, Euro Blue, and Burgundy billiard cloths are available. Our casino quality billiard is in stock for same day shipment. For more information on any of our Poker Supplies or to get our FREE 104 Page Casino/Gaming Supplies Catalog, please contact us at 1-800-233-0828.